“Ho Ho Ho, Merry Christmas”, this is Santa’s most popular phrase that he always enchants as he gives little children their Christmas gifts. 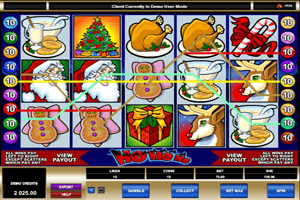 Microgaming has taken that phrase and decided to use it as the name of this slot machine since the game is themed around the magical and cheerful time of the year, Christmas. Players will quickly notice that theme once the game loads as players will see plenty of Christmas themed symbols and icons spinning on the reels of the game. Play Ho Ho Ho Slot here. These symbols appear scattered on the 5 reels of the game and its fifteen paylines that players can place their wanted stakes on. The stakes can be placed with ease under the game’s reels as players will go through the different available betting options. These options include the value of the coins, the number of betting lines players wish to activate as well as the number of coins. Players can earn plenty of reward through the line rewards of the game. Players can check those payouts by opening the paytable of the game. The highest payout is given by Santa as players can earn 15000 coins when 5 Santa symbols land on the reels. Santa is also wild which means that it will replace other icons. The Christmas gift is the game’s bonus scatter that will trigger up to 20 free spins with doubled payouts when at least 3 gifts land on the reels.